The Best Dog Wheelchairs Period! Doggon'Wheels is the professionals choice - our dog wheelchairs are the most widely used product by veterinary health care professionals around the world. This speaks volumes about the quality, design and function of our products. You will find our products in use at major veterinary teaching hospitals, physical therapy rehabilitation centers and also being used by veterinarians for their own pets who choose Doggon'Wheels products after seeing first hand the differences between our products and others. 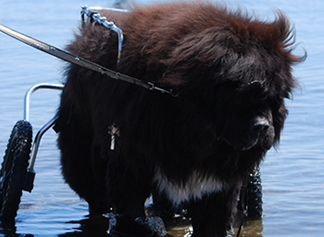 When deciding on a wheelchair for your dog, you need to not only compare price but experience as well. 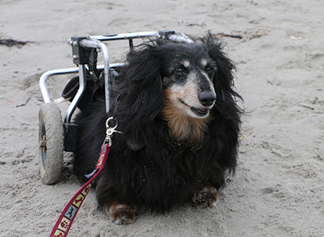 Doggon'Wheels has been providing the highest quality dog wheelchair at an affordable price for over 13 years. 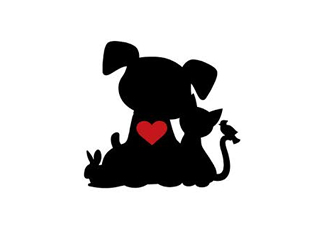 Others may have little experience in meeting the various needs of disabled pets- why trust your pets health to someone tinkering around with a "hobby"? 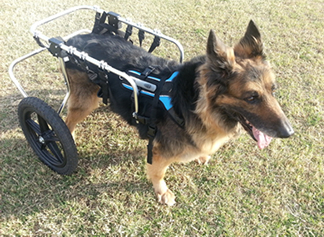 A dog wheelchair that is poorly designed can cause all kinds of health issues such as pressure sores and stress on the shoulders which will make using a wheelchair more difficult and cause long term issues as well. Our dog wheelchairs are durable, multi functional, allow for full range of motion and will not put stress on your dogs shoulders which makes it the most comfortable dog wheelchair on the market today. I can't put into words how happy it makes me to see my 12.5 yo GS run around again! Here is Sampson enjoying the beach. Thank you again for allowing him to do all sorts of fun stuff. We've Launched our new site! Doggon Wheels ©2019, all rights reserved.